When it affects you, it can quickly become one of the most trying times in your life. Your infertility journey, however, does not have to be so difficult. By being empowered with the right information, you can make the right choices ... leading to the most efficient path to success. This unique book is simple yet powerful, and sets you on the right path. It includes the most pertinent medical information that is easy to understand (such as ovulation induction, IUI, IVF, ICSI, PCOS, endometriosis, tubal disease, decreased ovarian reserve, uterine disorders, male factor, fertility preservation, preimplantation genetic screening / PGS / PGD, and reproductive surgery / hysteroscopy / laparoscopy). It also has chapters on social stressors (family, friends, job) and alternative therapies (acupuncture, herbs, yoga, diet). Furthermore, it has anonymous quotes from many infertility patients to put real voices behind the disease. The Infertility Journey is an ideal book to help anybody dealing with infertility. It is also a useful educational resource for anybody who knows someone going thru fertility treatment. 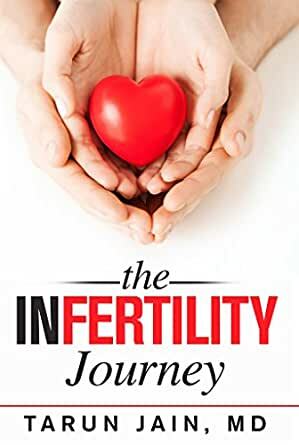 This book will greatly improve your understanding of the infertility pathway. Dr. Tarun Jain (tarunjain.com, @tarunjainmd) is a Board-Certified Fertility Specialist at Northwestern Medicine, and is annually selected as one of the "Best Doctors in America." Dr. Jain completed his fellowship at Brigham & Women's Hospital / Harvard Medical School in Boston, MA and his residency at the University of Washington in Seattle, WA. He holds dual Bachelor of Science degrees in Biomedical & Electrical Engineering from the University of Southern California (USC), a Master of Science in Biomedical Engineering from the University of Texas at Austin, and an MD with Highest Distinction from the University of Southern California (USC). Dr. Jain is an expert in all fertility treatments (ovulation induction, IUI, IVF, ICSI), as well as PCOS, endometriosis, tubal disease, decreased ovarian reserve, uterine disorders, male factor, fertility preservation, preimplantation genetic screening (PGS / PGD) and reproductive surgery (hysteroscopy & laparoscopy). Dr. Jain is also internationally known for his research contributions to the field of infertility, especially his work on mandated insurance coverage for IVF, & reducing disparities in access to infertility care. He has authored numerous publications, including 3 studies in the prestigious New England Journal of Medicine. Dr. Jain and his wife live in Chicago, Illinois with their two children. Very easy to understand. Goes over so many topics and so much help. I highly recommend if you are going through infertility and need more information.